Whether it is a the construction of a residential building or a commercial complex, the excavation of a site or erection of bridges, paving roads or a mammoth painting job, workers in the construction industry are at a significant risk of injury. In fact, this industry alone has a fatal injury rate that is way above the national average for all industries in the category. The department of Occupational Safety and Health Administration (OSHA) prescribes the measures that employers ought to adopt – right from the type of scaffolds to be used to the provisions for a portable toilet – to ensure the safety of their personnel. The most important aspects are highlighted here. Almost all construction sites require workers to use scaffolds and, therefore, it is vital to ensure these are erected in a safe manner. Scaffolds should be made of rigid materials and are to be erected on solid surfaces in such a way that they can bear their own weight as well as four times the maximum load that you expect to be used without any displacement. A scaffold should be provided with toeboards and guardrails, and the platforms should have planks held tight with the specified materials. Falls from a height are one of the occupational hazards of the construction industry. OSHA prescribes that whenever a site requires the use of an elevated working surface, the employer should provide an aerial life or an elevated platform for greater safety. The roof and floor edges are especially risky areas, and workers positioned here should be protected by the use of a body harness or by installing a guardrail system with warning lines. On any site where there is a risk of objects falling on a worker, the employer has to provide hard hats to the workers. Operations such as nailing, welding and cutting that may result in foreign objects entering the eye should not be performed without using face shields or safety glasses. On sites that are slippery or where heavy equipment is used, foot protection is a must and workers must use shoes that have slip-resistant soles. 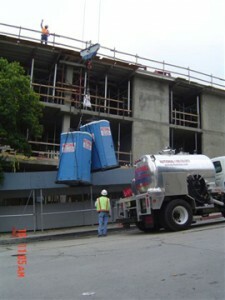 A construction site employs hundreds of workers and, therefore, the OSHA guidelines also specify the presence of a minimum number of toilets for their use. Many employers prefer to set up a portable toilet at a place on-site that is reasonably easy to access, as it prevents wastage of time when workers search for restrooms. Several portable toilet providers also offer regular cleaning facilities to ensure the restroom stays hygienic and does not pose a risk to the health of workers using it. On all construction sites; the employers can only employ workers who can provide evidence of their experience and training in using particular equipment, tools and machinery. A failure to comply with this is more likely to result in injuries and accidents that affect not just the erring worker, but also others working on site. Besides, employees should also be provided additional training to ensure they understand the measures to be followed to ensure safety during work as well as actions they need to take in an emergency. Whether it is the lighting of the construction site, the availability of a portable toilet, the use of protective gear or first aid arrangements on site, the OSHA guidelines cover all important aspects for safety of construction workers. However, the sincerity with which these concepts are adopted by an employer is the most important factor that decides how safe a construction site is for the employees working there.